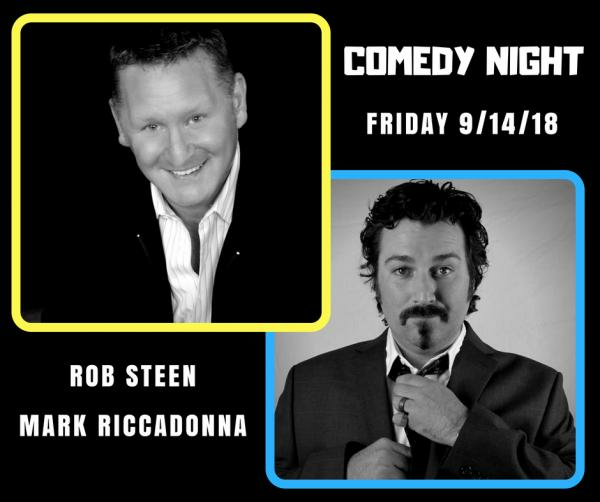 Bridge Street Live presents a Comedy Night featuring ROB STEEN and MARK RICCADONNA and Friday, September 14th at 8 pm! ROB STEEN has been doing comedy for 25 years. He began as a street performer at the age of 12 in Boston MA. Using his juggling and improv skills he decided to try Stand-Up! Since then he has kept a full calendar of over 350 shows per year! Rob has also been featured on several TV shows including The Late Show with Dave Letterman where he is a frequent guest. Rob is very high energy and will bring the whole audience together as a group with his unique style of crowd participation. His act is a mix of situations & observations that he has been in for the past 21 years of being an entertainer. Rob has been compared to Robin Williams due to his fast paced delivery & quick wit. Rob is great at working the crowd and making every show different. It is no wonder he is one of the most request comedians in the Northeast. Rob will keep you on your toes and laughing non-stop!! MARK RICCADONNA grew up an artsy jock outside of Youngstown, Ohio. At age 17 (like a bad independent movie), Mark moved to NYC in search of himself and happiness. He pursued Theatre at The American Academy of Dramatic Arts, joining "The Company" after graduation. Soon after, Mark stumbled upon Stand-Up Comedy and found success as a storyteller, performing throughout New York City, and 'on the road'. Mark currently also performs for Armed Forces Entertainment, and has entertained U.S. and U.N. Troops worldwide, performing in six continents while working with his childhood heroes. Outside of comedy, Mark is an accomplished actor and writer. Most recently Mark has a lead role in the feature film "Days of Power" and is writing for Saturday Night Live's "Weekend Update." Tickets are $15 for General Admission and $25 for VIP Reserved (+ fees).